Do you recall when the Accident Group collapsed and infamously sacked 3,000 staff by text message? The attached article describes a recent situation where a director sent a message to staff telling them not to come to work because the director no longer wished to work with them. What is the correct legal procedure for redundancy? Nippy Bus should have informed its staff that it was proposing to close and make them all redundant. It should also have entered into a minimum 30 day consultation with them before effecting any redundancies. Failure to comply with consultation obligations can result in each of the affected employees becoming eligible for an award of 13 weeks’ pay. This is in addition to their entitlement to notice and redundancy pay. Whilst there are defences to a breach of the consultation obligation, the bar is set high and the courts usually take a dim view of any attempt by employers to avoid their obligations. 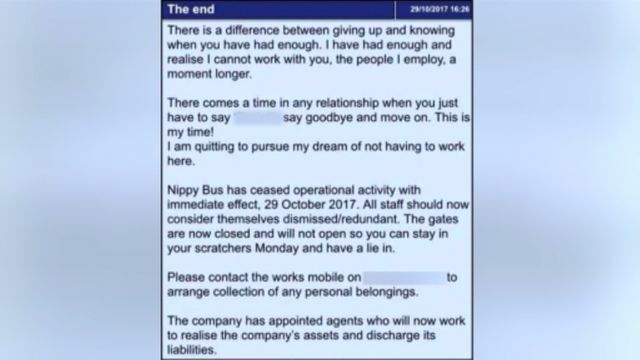 If Nippy Bus were putting less than 20 staff at risk of redundancy, there is no protective award or minimum consultation period, but it is still advisable to follow a procedure to avoid unfair or wrongful dismissal claims. There is a cautionary tale that taking short-cuts in employment matters can come with heavy penalties. A bus company appears to have closed suddenly with the owner apparently blaming the fact he cannot bear working with his employees.